For the wires within the EZK box, almost anything is big enough. Ask your office computer support person for a bad Ethernet patch cable, or a couple feet of stranded cat5 cable, pull the inner wires out and you'll have plenty of easy-to-work-with 24ga wire. For the power stage to coil, 18ga is ok.
And yes, wasted spark with or without chipping the box is OK. 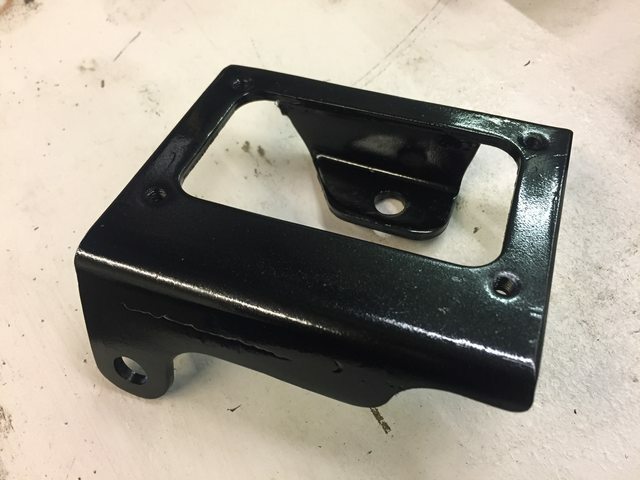 I've made a stand off plate to go above the rocker cover - how long do I need the long nuts to be to hold the plate high enough to clear the curve of the rocker cover and the part of the Bosch 2X2 coil that hangs through the plate? Yes I know, easy to measure - but I'm away from the car and hoping to get everything together for next time I go and work on it. If anyone could measure for me, that'd be great - thank you! This pdf has dimensions on the last sheet, but not the one you're looking for. I can take a measurement for you later today. Thanks - I've got the coil here, I can measure the distance the coil extends below the mounting point height... just checked it's 15mm. So take off the 3mm thickness of my sheet, leaves 12mm protruding down below the sheet. I'm wondering how high the nuts have to be to be so that the bottom of the coil clears the curve of the rocker cover? Actually this is clearer - what's the combined length of nuts in this pic? But my coil, like the one in that photo, does not protrude below the mounting plate. Perhaps your coil is a slightly different version? Mine is the same and the one in the link below and has a bulge on the bottom. Having now got off my arse and actually taken a look, I realise my recollection does not match reality. I have the same coil which is mounted to a flat plate with similar stand-offs so that the bottom is above the plate. Ok great- and 35mm standoffs are enough? I was going to go with 40mm and hope that was enough. My plate is 3 or 4 mm thick. If you go with 35 mm let me know! Okay so after reading this I'm still confused. What are the best options for coils and power stage? I love the look of the ls coils on the valve cover as opposed to the ugly bsi bracket with cool smack bang in the middle of the engine bay. Can I use any ls coils? From a golden or ford? Along with a Mazda mx5 power stage? 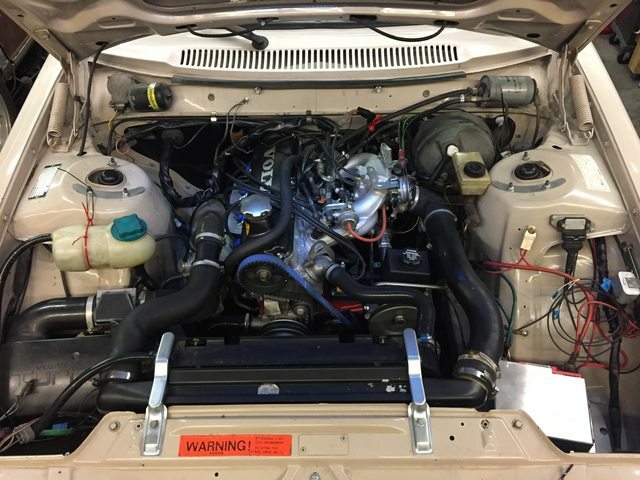 Care to elaborate on which coils and power stage and leads and how you mounted it? Can we please get a list of coils and igniters which work on lh2.4 cars ? Maybe you could add sections to the front page with what works. I've heard d585 could work but need a different chip from turbotankshane to work? Seeking cheap options that don't use that 2x2 Bosch coil pack. It's ugly. That's a good idea; I will work on putting that list together. 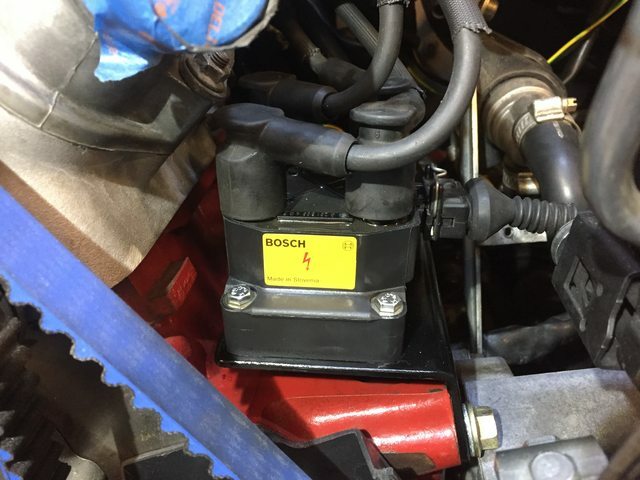 If your main concern about the Bosch 2x2 coil pack is that it's ugly, then maybe consider a different mounting location. 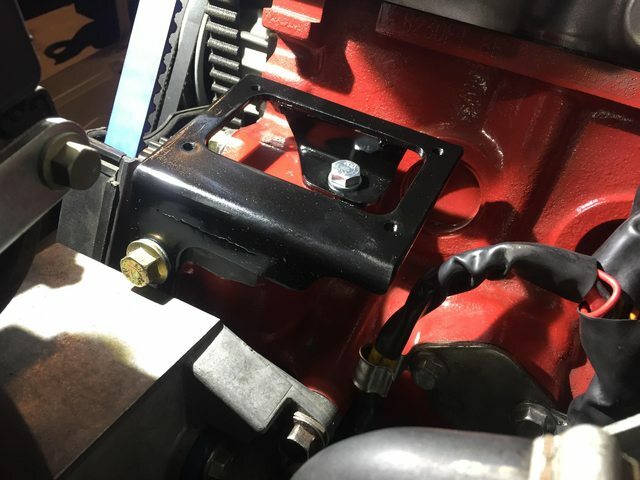 On my 242 I mounted it down where the distributor would be on a regular 240 redblock. This is a 940 block that originally had the rear head-mount distributor so it's got a plug in the 240 spot. I made this little bracket that mounts the coil right over the flat empty area. For plug wires I used a set made for a 240, but changed the ends on the coil side to the 740/940 style, which is what the Bosch coil uses. Thanks duder! That's a way cleaner install! Simply put - I quite like the look of using coils which are mounted on the deeworks bracket on top of the valve cover. I'm thinking I would like to find some good used coils to start with and something that is available here in Australia. Would love a list of what works or more info to find out what I should be looking for in potential candidates so i may be able to find something local that is plentiful. 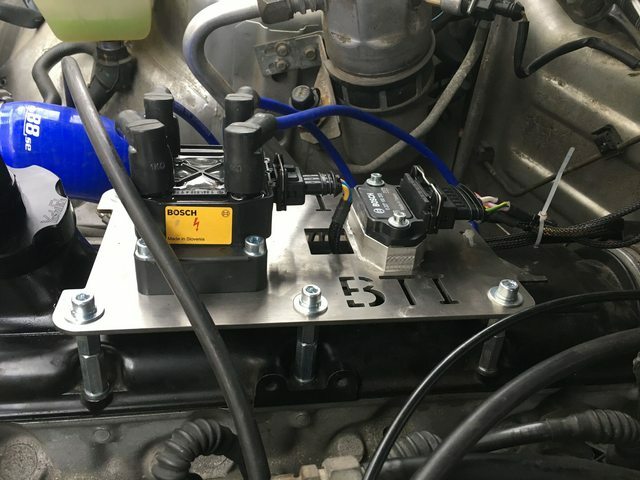 Would stock ls1 coils work from a holden commodore with internal igniters? Can someone please tell me what gauge wire I should use from the box to power stage and from power stage to coils? Electrically, 20ga is fine for both but I'd suggest 18ga because it's more mechanically robust. Would you suggest running extra fuses ? No need for extra fuses, if you're adding this to an LH2.4 / EZK system in good condition.